1-800-PetMeds Conceptualization, UI, UX, front end HTML, live for 10 years, site was redesigned 2016. 1-800-PetMeds World Games Contest Conceptualization and design front end HTML, live for 4 years, just taken down and redirected. peteducation.com Conceptualization, design, and development, live for 6 years, just taken down and redirected. news.petmeds.com Design and conceptualization, up for 6 years, site was just taken down. PetHealth101.com Conceptualization, design, and development. The PetMeds Partner Program Design and development, live for 6 years, redesigned 2016. NationalPetMeds.com Conceptualization, design, and development, lived for 8 years. 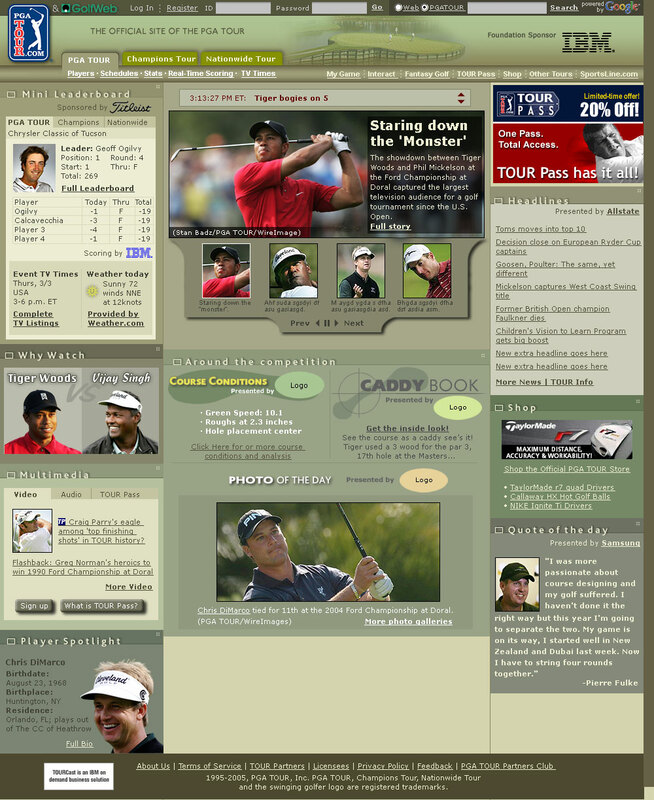 PGA TOUR Site Re-Design 2005 (changed since I left). See the original concept I designed. NFL.com Site Design (changed since I left). See the original concept. NCAA Sports Site Design (changed since I left). 83rd PGA Championship site Site Design (Not Live Anymore). 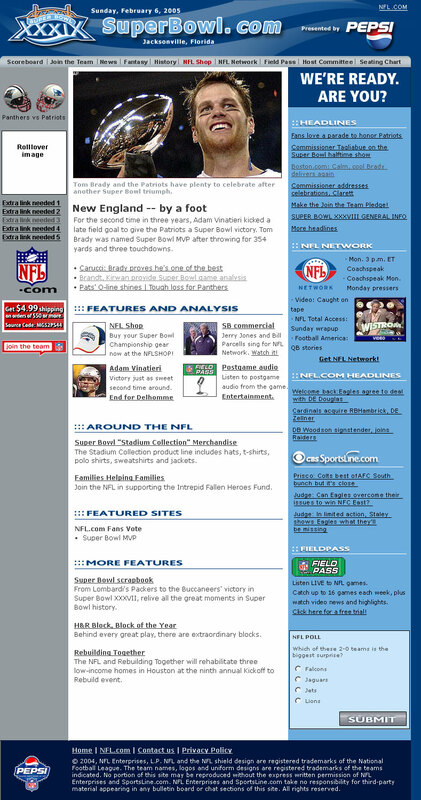 Super Bowl XXXVI Site Design. Super Bowl XXXVIII Site Design. See the original concept. Super Bowl XXXIX Site Design. See the original concept. 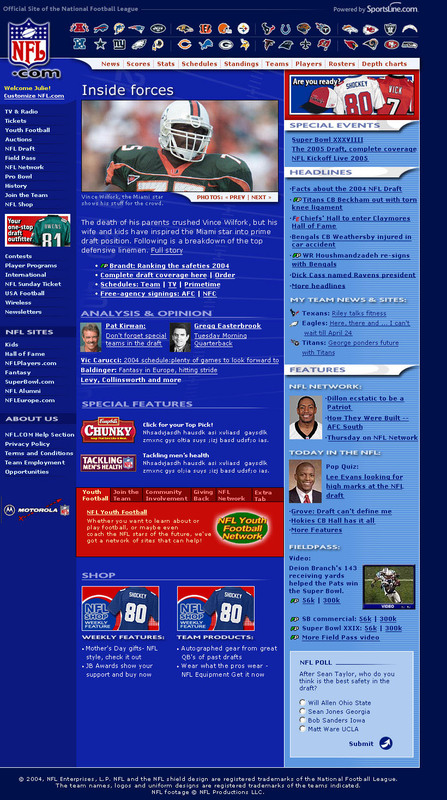 NFL Network Site Design. Site was taken over by the NFL and there is now a new design. Tri County Humane Society Design and information architecture of site. Live for 4 years, done as a charitable donation, site was redesigned 2012. Broward County Pharmacy Association Site Design UI, development & maintenance, live for 4 years, just redesigned 2016. Florida Pharmacy Foundation Site Design UI, development & maintenance, live for 3 years, just redesigned 2016. Ventura Salon and Spa Site design, buildout and maintaining the site, 4 year relationship. 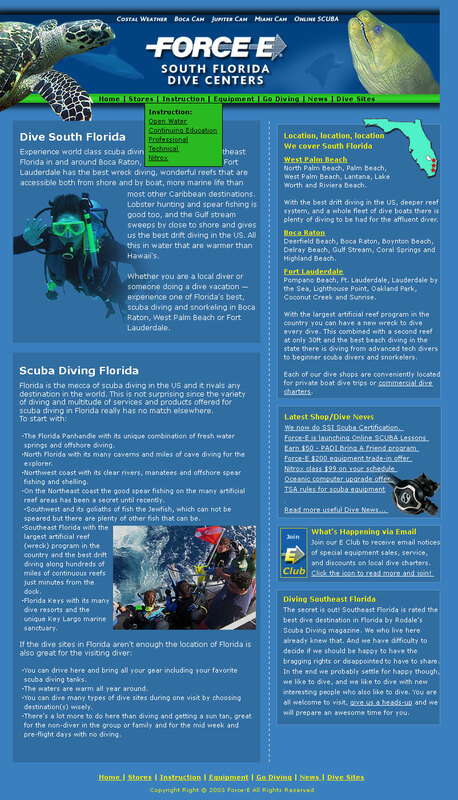 Force-e Scuba Center Site design, Information architecture, buildout, and maintaining site. 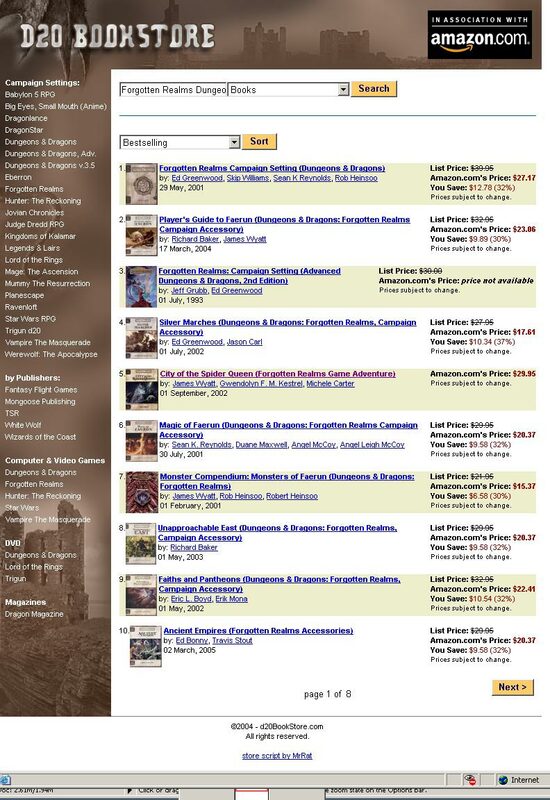 See the original concept (Site has been redesigned). Fill Express Design, Information architecture & development of site. Live for 6 years, just sold the business last year. See the original chosen concept. Upside Down Mortgage Design & Information architecture of site. Live for 6 years. Nature Soul Massage Design, buildout of the site. Live for 5 years. 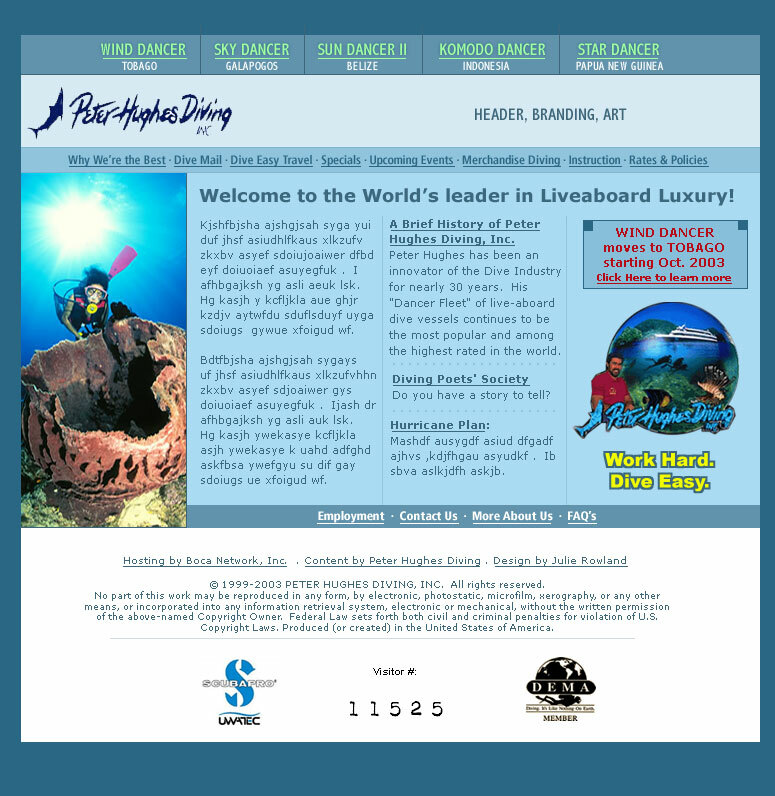 Peter Hughes Diving Site design, buildout. launched 2004-2011. See the original concept. Redesigned by new owners. Emagazines.com Site design. See the original concept. 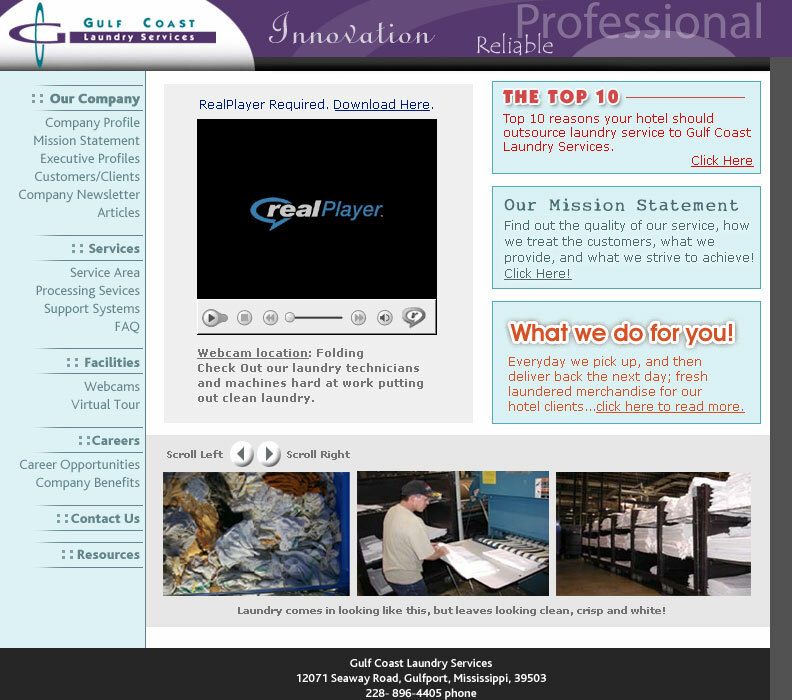 Gulf Coast Laundry Services Site design & buildout. See the original concept. 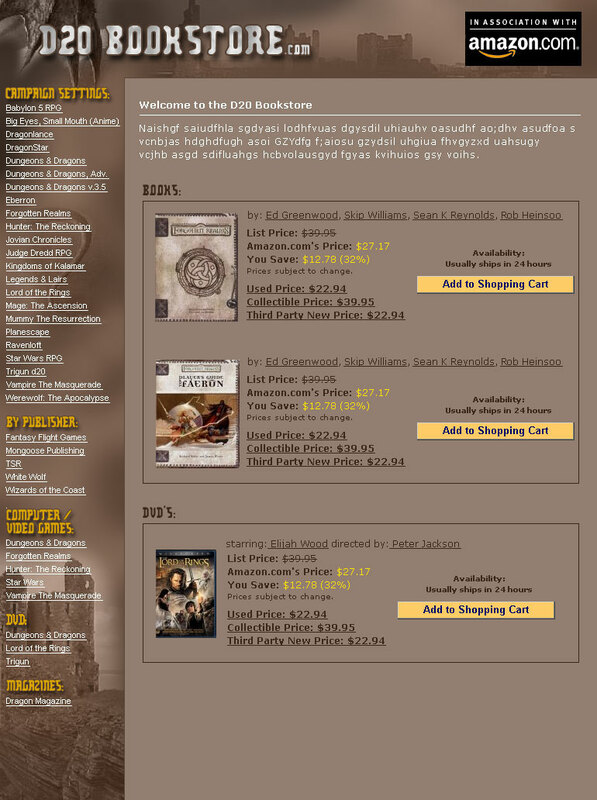 D20 Bookstore Site design. 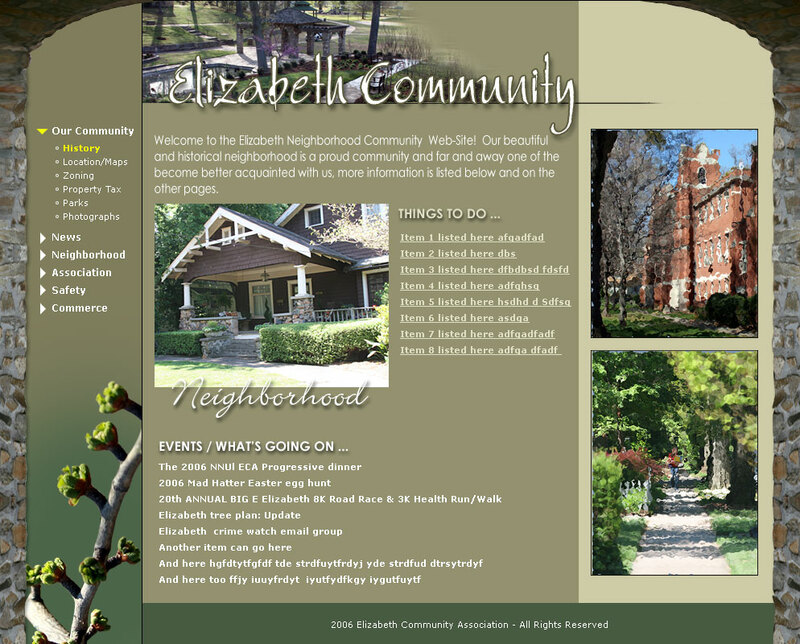 See the original concept homepage/Lower level page. 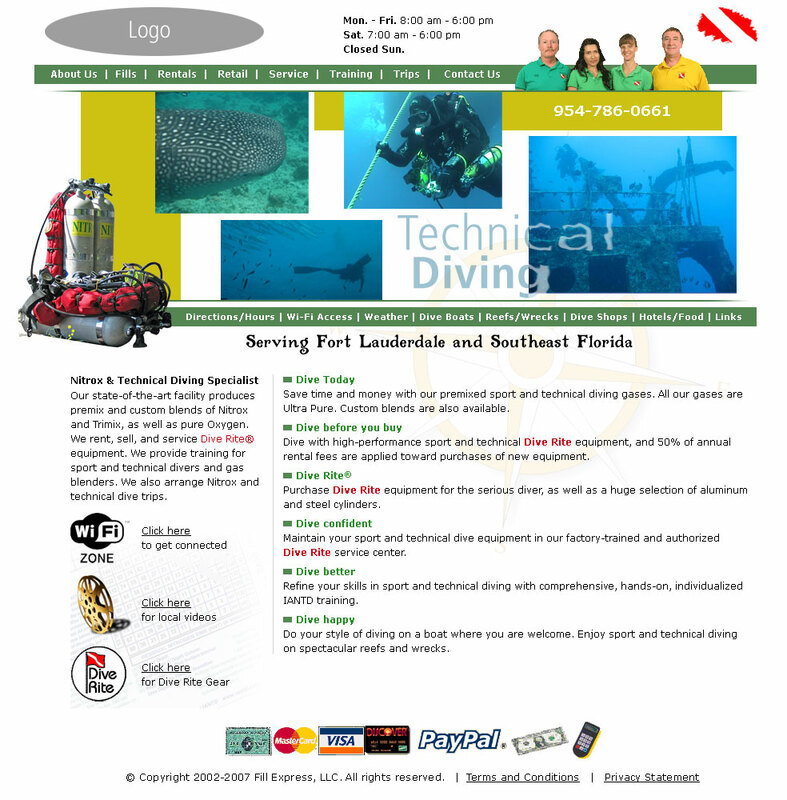 Greater Fort Lauderdale Dive Association Site design, buildout and maintenance, Live for 4 years. Since been redesigned. Aunt Ruth's Kitchen Site design & Logo Design. Live for 10 years. Tannenbaum Realty Site design. Live for 12 years.